Wholesale Supplier of a wide range of products which include lancer ultima 820lx, lancer ultima 1300lx, lancer ultima 1600 lx and laboratory glassware washers & dryers. Drying HEPA Filtered chamber and injector drying upto 95deg C.
Lancer Ultima 1300 LX Freestanding Glassware Washer Dryer easily copes with higher glasswares throughput or mixed loads as this model can wash and dry on three levels yet still maintains a small footprint, keeping in mind space limitations in the lab. The 1300 LX offers a cost effective choice if you require larger capacity washing. The load-bearing door is at a safe-convenient height for loading glassware at the washer rather than having to carry or transport heavy, loaded racks from workbench to washer. Drying HEPA Filtered chamber and injector drying upto 110deg C with 1deg increment. Lancer Ultima 1600 LX Freestanding Glassware Washer Dryer is an industry leader in terms of capacity. User can place 4 racks/trays simultaneously in Lancer 1600LXP. 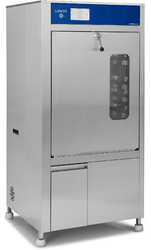 The ULTIMA series model 1600 LXP washer/dryer has been designed to meet and exceed the growing requirements of the laboratory industry for cleaning of glassware. ULTIMA series washers offer the best labware cleaning solutions in the industry, delivering high performance in a compact footprint. Efficient use of water, detergents, and rinsing agents minimizes the environmental impact while energy saving construction lowers total cost of ownership. 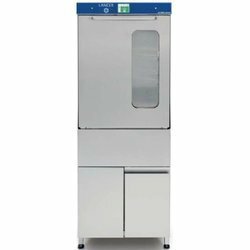 Lancer Ultima 1400 LX Freestanding Glassware Washer Dryer easily copes with your high volume throughput and mixed loads as this model can wash and dry on three levels, ideal for lab having majority of higher size glasswares. 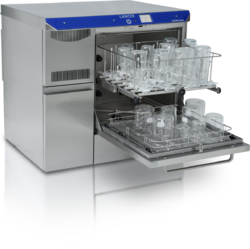 The 1400 LX offers maximum rack options if you require larger capacity washing on all three levels. The load-bearing door is at a safe-convenient height for loading glassware at the washer rather than having to carry or transport heavy, loaded racks from workbench to washer.